Kanoff signed a reserve/future contract with the Cardinals on Monday. Analysis: Kanoff spent less than a week on the active roster and was otherwise on the Cardinals' practice squad this season. The 24-year-old went undrafted out of Princeton last April and will spend his first full offseason in the league in the desert. The Cardinals signed Kanoff to their practice squad Friday, Darren Urban of the team's official site reports. Analysis: Kanoff spent a brief period on Arizona's active roster earlier this week, and he rejoins the team as a member of the practice squad. It's unlikely that Kanoff will see a meaningful role with the Cardinals this season, even if he's promoted to the 53-man roster again at some point. Kanoff was waived by the Cardinals on Thursday, Kyle Odegard of the Cardinals' official site reports. Analysis: Kanoff was promoted to the 53-man roster prior to a Week 12 tilt against the Chargers, and he has ultimately been released after less than a week with the team. The Cardinals will continue to roll with Mike Glennon as the only backup to rookie quarterback Josh Rosen. 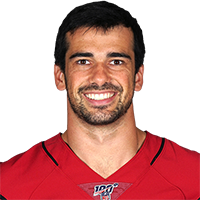 The Cardinals promoted Kanoff from the practice squad to the active roster Saturday, Darren Urban of the Cardinals' official site reports. Analysis: The Cardinals have rolled with two quarterbacks through most of November after releasing Sam Bradford early in the month. That changes with the addition of Kanoff, who figures to serve as the team's third-string quarterback moving forward. There are no videos available for Chad Kanoff. Click here to view all videos.